On Thursday, October 25, 2018, the Association of Women in Finance, in collaboration with Women in Capital Markets and the CFA society of Vancouver, hosted a luncheon event on “What is Driving Change in Board Diversity?”. The panel of speakers including Maureen Howe, Corporate Director of Pembina Pipeline, Methanex, TimberWest and Insurance Corporation of British Columbia, Rachel Colabella, Senior Governance Advisor at Watson Inc., and L. Scott Thomson, President and Chief Executive Officer of Finning International Inc., moderated by Melanie Bradley, Partner, Border Ladner Gervais LLP, held a thought provoking discussion in front of a highly engaged audience of more than 170 people. Diversity on boards drives competitive advantage and enables growth. Despite the improving long-term trend of increasing diversity on boards, last year registered a stagnation. Sound board practice management tools such as skills matrices, enabling term limits where appropriate, as well as using external board reviews all make a difference. Diversity on boards drives competitive advantage in multiple ways. Companies in the top quartile for gender diversity on their executive teams are 21% more likely to experience above-average profitability and longer-term value creation than companies in the fourth quartile for gender diversity. As Mr. Thomson summarized it, overall diversity leads to an increased pool of abilities on the board. The more experiences and different skills on the board, the more agile and able it will be. It was unanimously acknowledged that, as members of this community, we all have a responsibility to contribute to change. Although we have made meaningful progress, various statistics suggest we still have a ways to go. According to the 2018 Diversity Disclosure Practices report by OSLER, 31% of TSX boards remain without women. In 2018, only 14.8% of board seats for companies on the TSX were held by women. The year over year growth was only 0.3% from 14.5% in 2017 (versus a full 2.0% y-o-y change in the year before). This leaves the average number of women on TSX-listed boards at a mere 1.29 women per board. While one year does not make a trend, it would be ill-advised to ignore these signs of lack of progress. Per Maureen Howe, at the current pace of change, it will be 30 years before we can expect to see a balanced board gender ratio. The PWC’s 2018 Annual Corporate Directors Survey supports this projection. Highlighting the importance of inclusion over diversity, Ms. Colabella cited Vernā Myers (Diversity Advocate & Lawyer and now, VP Inclusion Strategy at Netflix) noting that “diversity is being invited to the party and inclusion is being asked to dance”. 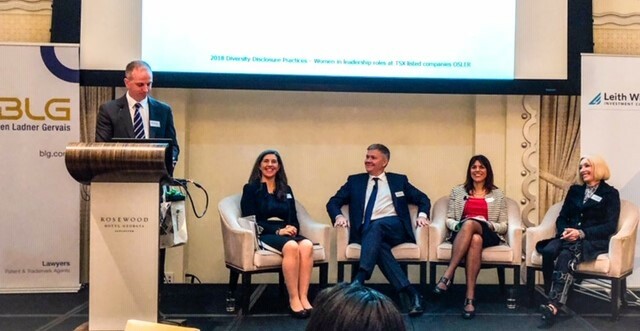 The consensus of the panel seemed to be that this is where leadership, together with its behaviours and practices, becomes instrumental in shifting diversity on boards from just a check box concept to a competitive advantage for the companies they run to harness. The top practice management tools discussed by the panelists included using a skills rubric to promote accountability from board members, introducing term limits to encourage board succession and strategy planning, as well as consulting an external board advisor to provide an outside view and a fresh set of eyes. The moderator further referred the audience to the Board Directors’ Playbook by Canadian Gender and Good Governance Alliance as a great thought-starter source. The value of the Outside Voice, essentially an external advisor, was also echoed as a strong practice management resource across the panel. The question remains, what more can be done. We need to break the decades of unconscious bias, especially around the concept of “not enough qualified candidates”, to ensure there is a pipeline of diverse executives ready to fill board seats. This starts with the encouragement of gender equality, introduction of new social initiatives (e.g., promoting equal parental leave), implementation of structural changes in the workplace, and carrying through to practice management in our own professional lives. On behalf of the organizing committee, the AWF would like to thank the audience, our sponsors, panelists, and volunteers for graciously providing their time and a platform to have this important discussion. Thank you for continuing to move the needle on change!